(Locality: Laguna Garzon) It has very pretty, soft, silvery-white, fir-like spines, often with red centrals. The exciting lemon-yellow flowers with pale anthers and scarlet stigma open during the day and close at night. Origin and Habitat: Southern Brazil (Rio Grande do Sul), Uruguay, Paraguay, northern Argentina. Habitat: Native to the grasslands. Cereus scopa (Spreng.) Salm-Dyck ex DC. Echinocactus scopa var. albicans Arechav. Echinocactus scopa var. candidus Pfeiff. Notocactus scopa var. candidus (Pfeiff.) Backeb. Notocactus scopa f. ramosus (Osten) Backeb. Notocactus scopa var. ramosus (Osten) Backeb. Parodia scopa f. cristata hort. Parodia scopa f. splendens hort. 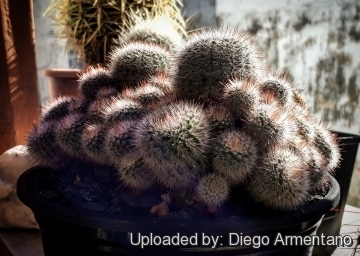 Parodia scopa subs. succinea f. albiseta hort. Notocactus scopa var. albispinus hort. Notocactus succineus var. albisetus hort. Notocactus succineus var. albispinus hort. Parodia scopa f. albiseta hort. Parodia scopa var. sulphurea hort. Notocactus scopa var. sulphureus hort. Notocactus scopa cv. inermis cristatus hort. 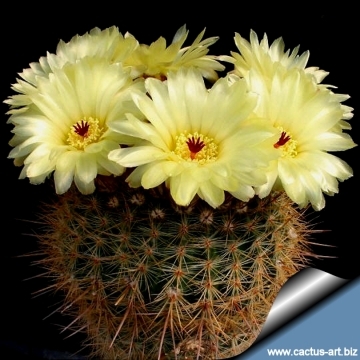 Description: Parodia scopa is a silvery spined cactus often clustering with showy yellow flowers. The stems are almost hidden by soft tufts of bristly spines somewhat similar to small brushes. 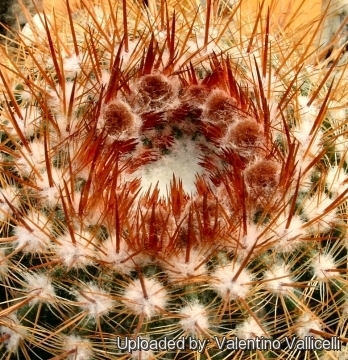 The mixture of white and red-brown spines, varying from plant to plant. Stem: Dark green, at first globular, becoming bit columnar to clavate with age, depressed apically, up to 45 cm tall, 6-10 cm in diameter. Ribs: 25-30 (sometime up to 40 or more) low, obtuse, finely notched into low warts tipped with areoles, which may spiral slightly. Central spines: About 4 (but varying from 2 to 12) medium length (6-12 mm long), needle-like, stouter than radials, purple, red-brown, orangish or white. 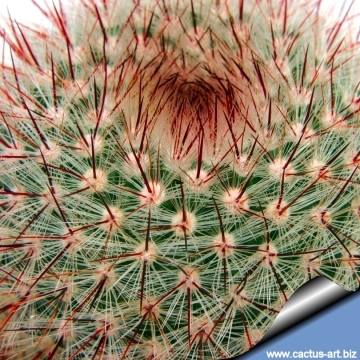 Radial spines: Shorter, fine, bristles-like, glassy white or yellowish, 5-7 mm long, spreading around. Flowers: A cluster of satiny, bright yellow flowers spring in the upper part of the stem forming a ring, The are 2-4 cm long and 3,5-4,5 cm in diameter. , Pistil with about 10, rayed, bright crimson stigma lobes. Tube short. Scales on the ovary woolly with brown bristles. Fruits: Globose, about 7 mm in diameter, opening at maturity, with numerous seeds. Notocactus scopa var. murielii Hofacker: has silvery spined stems. Distribution: Uruguay. Notocactus scopa f. xicoi (W.R.Abraham) N.Gerloff & Neduchal: has fewer ribs and fewer spines. Particularly striking are the numerous purple brown central spines. Distribution: Pedras Altas and Herval, Rio Grand do Sul, Brazil. Notocactus scopa f. xiphacanthus (W.R.Abraham) N.Gerloff & Neduchal: has larger stems with fewer ribs and usually a long, dark, sword-shaped central spine. Distribution: Minas, Lavalleja, Uruguay. Parodia scopa (Spreng.) N.P.Taylor: has stems with 30-40 ribs, about 4 central spines, and 40 or more radials. Distribution: Southern Brazil and Paraguay. Parodia scopa f. cristata hort. : Crested form. Parodia scopa subs. marchesii (W.R.Abraham) Hofacker: has stems with fewer ribs (19-28), 2-4 white or yellowish central spines, and about 40 radials. Distribution: Treinta y Tres, Uruguay. Parodia scopa subs. neobuenekeri (F.Ritter) Hofacker & P.J.Braun: stems with 18-21ribs, 6-12 strong central spines, and 30-40 radials. Distribution: near Camaqua, Rio Grande do Sul, Brazil. Parodia scopa subs. succinea (F.Ritter) Hofacker & P.J.Braun: has stems with 18-24 ribs, 8-12 central spines, and 15-30 radials. Distribution: near Sao Gabriel, Rio Grande do Sul, Brazil. Parodia scopa subs. succinea f. albiseta hort. : has pure white spines. Parodia scopa var. sulphurea hort. 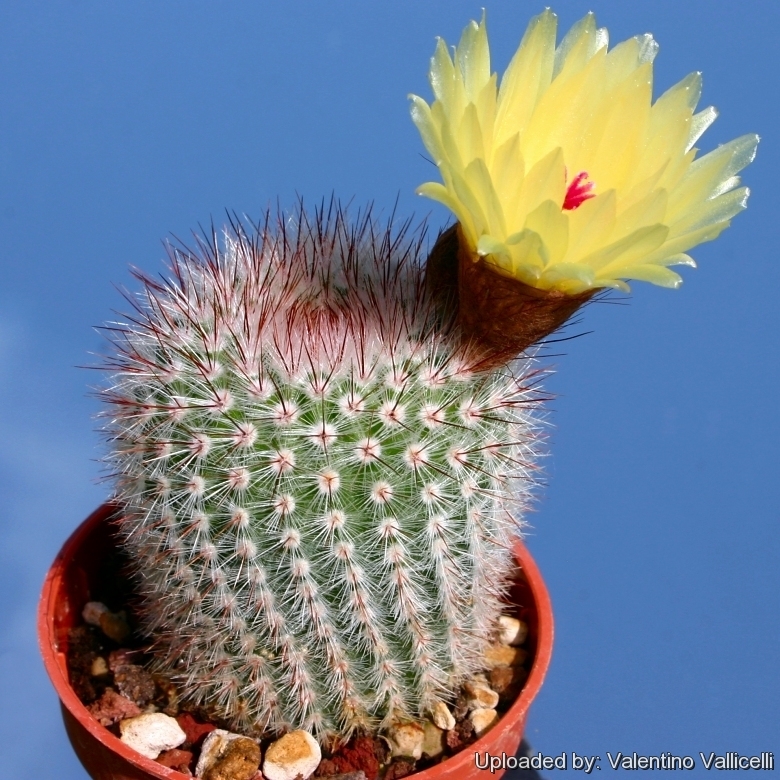 : This is only a common hoticultural name for "Parodia scopa ssp. 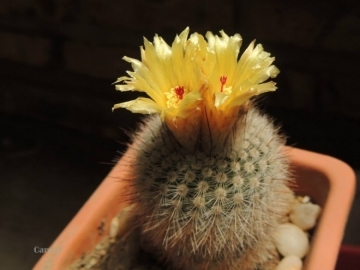 succinea"
Parodia scopa cv. inermis: has spineless areoles with a short white wool, they are arranged geometrically and contrast with the stem. 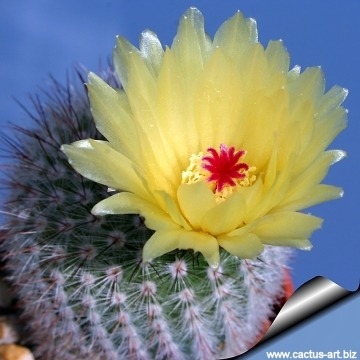 A few small bristly spines are occasionally produced in the flowering areoles. Parodia scopa cv. inermis cristata: Crested form. Notes: The Notocactus scopa aggregate is an ensemble of related species comprising Notocactus scopa, Notocactus schlosseri, Notocactus scopa var. 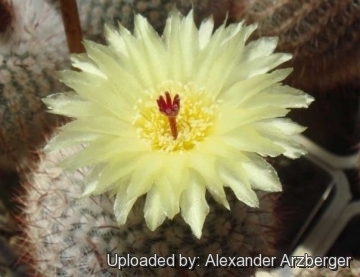 xicoi, Notocactus sucineus. 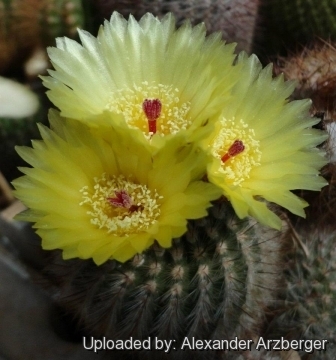 This plant has been Transferred to Parodia in 1997 by David Hunt. Cultivation and Propagation: It is easy to grow. It prefers a neutral to slightly acidic mineral-based potting mix with a good drainage. It likes a warm bright location, does great in partial shade but doesn't like full, hot blazing sun in the central summer month. Can support quite some water during the growing season but pot plants in winter are wet-sensitive and needs to be kept dry (rots easily if soil is wet and cold) tends to lose its roots in winter. Usually it is recommended to over-winter this plant in a bright and warm greenhouse with at least 8-10° C , but it has proved to tolerate temperatures as low as -5° C for short periods. Propagation: Seeds, cuttings or root suckers (if available). Not too difficult to raise from seed.